Those that do drink out of a straw. Those that don’t drink out of a straw. Most people simply have a preference of how they like to get their drinks into their mouth. Some like to tilt their head back and let the cold drink flow, while others like to sip it through a straw. Which kind of person are you? While drinking out of a straw is mostly due to preference, there are also other factors that can determine your straw use. If you got any type of oral surgery, drinking out of a straw is a ‘no-no.’ The sucking action of drinking out of a straw may cause your blood clot in your socket to dislodge causing dry socket. If you’re drinking carbonated drinks through a straw you may want to reconsider. This action actually can cause you to have gas. And let us remind you that when you have gas on the inside, it must come out somehow on the outside… usually not a pleasant experience for you, or those around you! When you drink out of a straw it can help prevent certain beverages from staining your teeth. When you bypass your teeth while sipping on staining liquids such as coffee, tea and wine, it can prevent tooth discoloration. Straw drinking can help you have less deterioration of your enamel and less sensitivity in your teeth. 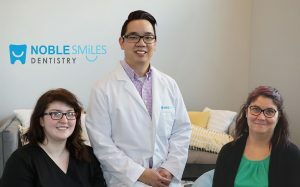 If you have, or are about to have an oral procedure, such as wisdom teeth removal or teeth whitening, be sure to discuss with us at Noble Smiles Dentistry the benefits or harmful effects of drinking through a straw. Call and book your appointment with us today!